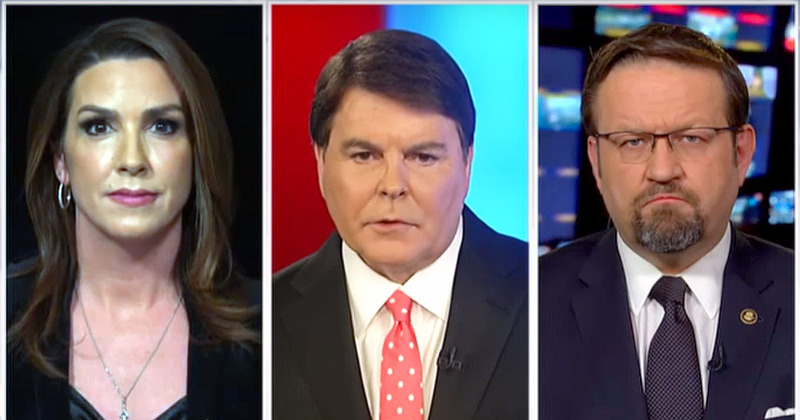 Sara Carter, Gregg Jarrett and Dr. Sebastian Gorka reveal their insights and what sources are telling them will be happening next, following the release of the Nunes memo, which they say could be as little as ten percent of the information detailing corruption that will be coming out. There’s the DOJ Inspector General’s report due out in the coming weeks as well as a document release by Senate Judiciary Committee chairman Charles Grassley that may be released next week. Gorka reminds the audience that Rod Rosenstein, on the 16th of May, escorted Robert Mueller to his interview for the position of FBI Director, which Mueller failed. The next day Rosenstein appointed him to be special counsel. Of course any shred of objectivity or at a minimum the ability to claim it vanished when he applied and was denied the position by the same President he now is leading a witch hunt against. Carter says there is going to be a chorus in Congress now calling for a second special counsel to “investigate the investigators” and the issue of lying to the FISA court that was the focus of the Nunes memo will be front and center. If the Intel Committee didn’t already have enough motivation to pursue Rosenstein, Comey and the rest of those named in the memo, as well as their enabler, Attorney General Jeff Sessions, Rosenstein clearly gave them more with his threats. Sessions was praising Rosenstein and his number three in the DOJ, Rachel Bland in a speech just before the memo was released. Is Sessions an idiot or just doing his job as a corrupt, deep state operative? He’s unsure of himself and jerky in his manner, but doesn’t seem stupid. He’s right at home in the deep state DOJ. At this point I’m going to require some evidence that Trump is not part of the swamp. A theoretical case can be made Trump is all in. He removed Gorka, Bannon, Flynn, Preibus(who was marginal), and went along with Pence. He brought in every corrupt globalist and has them forwarding their agenda. The neocons seem to be in charge of the war complex and we are still spending like drunken sailors. The debt is expected to go up another 1 trillion, and unfunded liabilities are, I believe, at 200 trillion. All of the big0’s anti-Americans are still in their positions, and Sessions has been polishing the swamp for a year. Trump has done a great job on the economy, but it mostly favors Wall St., which is good and benefits most of us, but he hasn’t fought for the campaign promises. According to some news shows, PBS Newsweek is one, there is no criminality brought out in Nunes’ memo. If so, why were the Dems and the DOJ so adamant about keeping it a secret. If pursued, Obama himself will be going to Gitmo. Hope to God that happens. We could get our tax money back from him and his daughter, who surprisingly enough, became a millionaire while Obama was president. Apparently Michael collected a whole bunch of property and money too. Now rumor is that Mueller is going to check on the President’s business transactions BEFORE HE BECAME PRESIDENT. I hope the idiots he has for lawyers put a stop to that. Mueller thinks he’s a God now, when he really is the devil, trying to take down our President and our country. Rosenstein was also involved in the Uranium one deal as well, and so was Mueller. BOTH HAVE BEEN COMPLICIT AND COMPROMISED BY THEIR CRIMINALITY AS WELL. as for SESSIONS, HE IS A LOST CAUSE, Trump just needs to FORE HIM PERIOD AND ASAP.